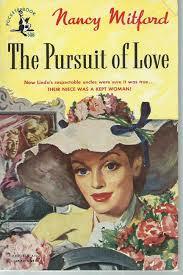 Nancy Mitford’s The Pursuit of Love (from the Really Like This Book podcast scripts catch-up) is not at all an obvious political novel. She excelled in, and is very famous for, her novels of the totally frivolous and madly eccentric lives of characters based loosely on her life and family. 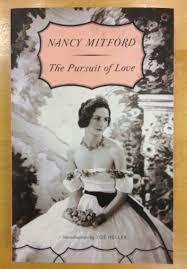 They’re all upper-class glamour and insouciance worn lightly, because that was the only life she knew. She was eye-wateringly arrogant because she didn’t know any other way to behave, but she had a superb talent for chatting, telling stories, writing letters, gossiping in the most delightful way. One would like to sit and chat to her for ever. 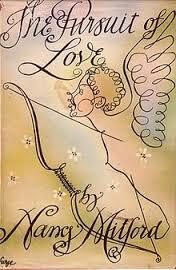 But in this novel, The Pursuit of Love, there is a remarkable amount of politicking going on. The whole novel is a disquisition on the nature of politics, if we think of politics as the balance of power. The story is a glorious satire on the politics of marriage, and also on less licit relationships. More conventional international politics come in as well, as do the politics of hospitality, and the politics between children and parents. Let’s start with that, how the children and parents struggle to keep the upper hand, to stay in control. The novel begins with narrator Fanny’s matter of fact stories of apparent child neglect and ill-treatment. These are pretty extreme, but so are the characters. Uncle Matthew is a raging tyrant who loves his children very much, and has brought them up to expect to be hunted by dogs as a very big treat. It’s only when he tries out the Child Hunt in foreign territory, when he goes to visit Fanny’s home with her cousin Linda Radlett, that hunting children seems an appalling thing to do. No-one is cossetted in the Radlett house, a vast and freezing mansion called Alconleigh, unless they’ve been out hunting themselves, in which case they are given eggs for tea and sent to bed to rest. Aunt Sadie is vague, and dislikes hearing about illness, so (as with Nancy Mitford’s own mother) her children get ill and recover with very little assistance or notice. Fanny, the narrator, lives with the Radletts half of the time, and with her other Aunt Emily while she is at school, because her own mother, who is not called the Bolter for nothing, had abandoned her practically at birth. Fanny is lucky for being adopted by Aunt Emily, because she at least gets an education and devoted care. The Radlett girls are taught to read and write at home, to speak French and to play the piano badly, and they ride well: but that’s it. Their father won’t let them go to school, since they won’t learn anything there that a lady needs to know. So what century are we in? The Radlett children are brought up under medieval conditions (says Fanny), but they’re living in the 1920s. Lord and Lady Alconleigh are unaware of anything useful or desirable in modern times, and see no need to bring their daughters up in a manner that might prepare them for modern life. Cousin Louisa tries to do what is expected of her by marrying a man (another lord) twice her age at the other end of the country: she continues to be dutiful by having five children, but is otherwise boring, and rather resentful that her good behaviour is not rewarded with extra parental love. Her scandalous Radlett siblings get all the attention. Jassy runs away to Hollywood and marries a film star. Their brother Matt runs away from school to join the Spanish army. The second daughter, Linda, her father’s favourite, causes the most trouble, since she marries an appalling bourgeois banker, then runs away from him for a Communist, and finally runs away from him into the arms of a French duke. Such behaviour is dangerously close to that of the Bolter, her aunt, but Linda is engulfed in love for Fabrice, and knows she has done the right thing, because although her upbringing was bizarre and eccentric, it was full of love, and she knows real love when she sees it. She leaves her parents’ control when she married the banker, and then things begin to go wrong. She never tells her parents that she’s left her second husband (the Communist), because this information would tip the balance of power from her supposed husband back to her parents. Without them knowing, and without either husband caring, she is free at last to fling herself into a delirious affair of the heart. This brings us to the politics of a relationship. Linda’s first husband Tony is a prig and a bore, and grows to be so tedious that even their child is as boring as he is. Linda collects delicious chattery friends, who congregate in her house as soon as Tony has gone to the bank, and has a lovely time, but it is also a futile time. She does nothing, she learns nothing, her in-laws disapprove of her because she is not being useful wife for an important banker. Linda does exactly as she wants: Tony can’t control her at all. One dreary lunch-time at her in-laws ‘country’ house in Surrey (Radletts don’t count Surrey as real country), Linda meets Christian, the son of a neighbour, and an intense and devastatingly handsome Communist. She falls in love, and a few weeks later takes a taxi to move in with him. Since she divorces Tony and marries Christian she has moved from one husband’s control to the next. Her life, bereft of glorious chatting, is now very earnest, and worthy, and busy, and not at all fun. Christian is also fairly indifferent to her, even when she follows him to the Pyrenees to help with the arrival of Spanish refugees. On realising that Christian and a very boring and worthy welfare worker called Lavender are made for each other, Linda also realises that she isn’t relevant. There is no struggle for power, there is nothing to fight against, the marriage has simply dissolved. Politics don’t even come into it because Christian is so uninterested in his wife. The goalposts in their marriage (are there goalposts in a marriage?) have been shifted by external conditions which make Linda irrelevant and Lavender essential. Linda takes a very uncomfortable night train to Paris, and then finds she is stranded, with no money, no-one to help her. She sits on her very expensive suitcase in the Gare du Nord and cries. With her next entanglement (Linda’s life is ALL about her emotional experiences) falls completely and whole-heartedly into someone’s power. Fabrice, duc de Sauveterre, picks her up on the station platform, installs her in a hotel, and she holds out for a couple of days before succumbing to his delicious blandishments. Linda is very happy in Fabrice’s power. To be looked after as a gentleman’s mistress is to be treated generously, lovingly, and quite strictly, and she adores it. But Linda has burnt her boats and is dependent on Fabrice emotionally, if not financially. She has exchanged her fidelity and her sexual favours for an apartment and unlimited money, but all this is irrelevant: their emotional satisfaction and the pleasure taken in living and being together is far more important. Back in the shires, there is an entertaining struggle for power between the upper classes trying to show their superiority and dominance over the lower classes. Uncle Matthew battles with the housemaids, because they insist on sweeping out the wood ash from the hearths every morning, whereas he wants it kept there, warming the rooms. The Radlett children are in a continual battle against Craven, the gamekeeper, because of all the animals he traps. They form a secret society called the Hons (because, as the children of a lord, their title is ‘the Honourable’, and the enemies of the Hons are the horrible Counter-Hons. This is all predicated on the aristocracy being better than the bourgeois, but in the children’s eyes, the head groom Josh is an honorary Hon because they adore him so much. Mrs Josh who makes their ball gowns is also an honorary Hon, and this appellation of the aristocratic value system becomes their private code for a person they like, a good egg. When the children make slips by erring in class-based vocabulary, there are eruptions. Uncle Matthew criticises Fanny’s language violently because she uses words that he disapproves of: note paper for writing paper. When Linda marries Tony Kroesig, her traditional English upper classes encounter his bourgeois, City standards for the first time. Their mutual disapproval is made worse by the Kroesigs being a first-generation German family who like Hitler very much. Linda’s great friend Lord Merlin teases the Kroesigs with one-upmanship, and large, vulgar gifts for Linda. Kroesig values are dreary and money-grubbing: Lord Merlin and Linda spend their money for pleasure, not for investment. Finally, we have international politics. The Kroesigs approve of Hitler. Christian shows himself to be an Hon by teasing the Nazis, ringing them up and arguing with them for fun, so once he arrives in Linda’s life, she pays proper attention to the European situation, instead of thinking that all politics are tedious because the Kroesigs are too. She too becomes a communist, and one of the funniest parts of the novel is when she chats to Fanny about her communist friends and her work with the Comrades, all in the most insouciant upper-class English. The novel’s underlying seriousness intensifies with the arrival of humanitarian politics during the internment of the Spanish refugees at Perpignan. Linda’s ignorance and frivolity produce unexpected results. She doesn’t read Spanish but is asked to assign cabins to Spanish refugee families on a ship sailing to Mexico. For every family on the list who appear to also have a Labrador with them, she gives them the best cabins, since she adores dogs and used to have the sweetest Labrador puppy. This has the very happy result of assigning all the best cabins to the lowest labouring classes, who are the ‘Labradors’ on the list, leaving the intellectuals and the upper classes cramped in the bottom of the ship. It’s a typical Mitfordian approach to politics: make it personal, fail to understand the wider implications, but produce a delicious joke, and make everyone happy except the horrible ones who are Counter-Hons and don’t count at all. 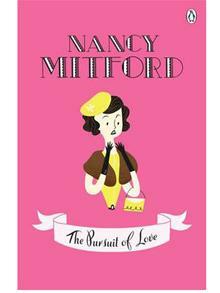 I do love this novel: reading Nancy Mitford’s writing is like swimming in bubbles of linguistic joy, knowing that there are deep waters beneath, if you care to look.